It truly was a night to remember, and one that will have a lasting effect on the lives of 17 families that were badly hit by the recent floods in Almeria . An amazing €12,000 was raised for the flood victims at a charity dinner-dance followed by an auction and raffle at the El Mar la Mar in Villaricos. 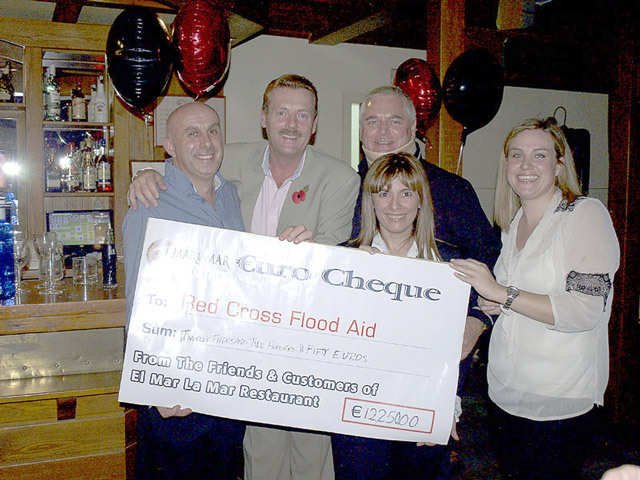 Around 100 people attended the big fund-raising event hoping for prizes thatincluded a round of golf with English cricketer Ian Botham, a weekend for two at the five-star Don Carlos Hotel in Marbella and a meal with James Hewitt at The Polo House restaurant, plus a flat screen television donated by Euro Weekly News. Michel and Steven Euesden, publishers of the Euro Weekly News, attended the function and were accompanied by key staff from the newspaper’s Costa del Sol headquarters, along with representatives from the paper’s office in Mojacar.